One of my favourite writing blogs, the Bookshelf Muse, had a post about writing suspense and cited the Hunger Games by Suzanne Collins as an example of fine fiction. I'd never heard of the book, but I picked it up on Friday night and fell into some great post-apocalyptic storytelling. I just couldn't read it fast enough. It's a young adult novel about sixteen-year-old Katniss Everdeen who lives in Panem, one of the poorest districts of what was once the United States. Katniss hunts, traps and gathers with a friend to feed her mother and younger sister. Katniss and her family, like most other people in district 12, live hand to mouth. Years before, the 13 districts waged war on the Capitol, but were defeated. Under the terms of surrender, each district has to send one boy and one girl annually to the Hunger Games, a televised event, where the participants fight until there is only one person left. The participants are selected by lottery. When the name of Katniss's younger sister is drawn, the elder Everdeen steps up to take her place. Inspired by reality tv, the Hunger Games uses its audience and producers to decide the rules and the terrain as they go. Far from being the strongest, fastest or biggest, Katniss is a strategist, sizing up her opponents and using her own archery and hunting skills accordingly. She joins forces with Rue, another girl with a complementary skill set, until Rue is killed. Fortunately, her team mate is able to leave Katniss some important supplies, such as night vision glasses and leaves that draw out infection which help her later in battling some of her most formidable opponents. After I finished the book, I was online buying Catching Fire, the second book in the trilogy. It's been a long time since I've stayed up a good part of the night reading. Sixteen-year-old Katniss is a wonderful, resourceful character that young adults can readily relate to and learn from. It's so refreshing to pick up a book about a teen who has so little concern about her outward appearance. Our heroine is self-effacing but nevertheless realistic about her skills and those of her opponents. I loved the grittiness of Katniss's character, and I think that so many young women will see her as a positive, intelligent role model. Another great aspect of this book is the teaming up of Katniss and Rue. The camaraderie between women rather than competition is another positive and welcome theme in this novel. In short, I'm overjoyed to find a book with a non-traditional heroine who draws on all her physical and psychological skills to be the best she can be. This is a fabulous book that both young women and their parents will enjoy. 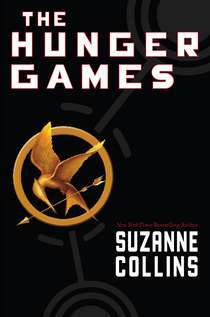 : Review: The Hunger Games by Suzanne CollinsTweet this! This book makes you think, and you get lost in its world. Suzanne collins paints such a detailed picture. I just finished the book and I want to pick it right back up and start it over again. That is how much I am in love with the hunger games.